EM-347-48V is brushless DC-motor driver with hall sensor feedback. The unit has a mosfet power stage with good efficiency and it meets also todays EMC requirements. The driver can be used with 120° commutation. 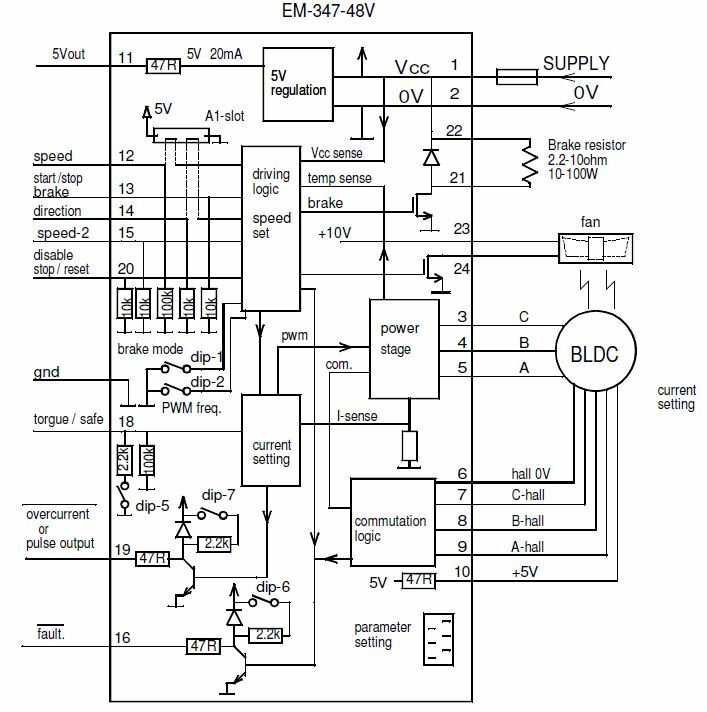 This driver has true 4Q power stage, and it makes possible to use regenerative braking. In this braking method the supply voltage rises, this voltage rising can be controlled with braking resistor. If uses battery supply then the braking energy can be leaded back to battery and braking resistor will not needed. The unit has the basic digital command inputs like direction, brake, start/stop, disable and there is analog inputs for speed and current control. One digitally presetable second speed (speed-2) is possible to activate with digital command input. EM-347 has two NPN outputs for fault and overcurrent indication use. Some input and output functions can be modified with parameters. Driver includes overvoltage, undervoltage and overtemperature protections. These fault situations are indicated with fault on-board LED. Overtemperature and current limit situations can be reset with reset input, reset-timer or by setting analog speed control to value to 0. There are two control options for speed. Direct control ( open loop ) sets motor voltage in propotion to control voltage as with a standard DC-motor. Closed loop uses hall sensor feedback for speed control, this mode offers good speed regulation. Start and stop ramps work in both mode. Speed adjust range, closed loop rpm range and ramps can be set with parameter. Analog input are filtered so that there can also use PWM signal for control speed and current. Device has also output for cooling fan, it can be controlled optional fan if needed. This output switch on fan, when temperature rises over 65 deg.